Toyota City, Japan, Mar, 01 2019 - (JCN Newswire) - Following its victory on the snow and ice of Rally Sweden to take the triple lead of the manufacturers', drivers' and co-drivers championships, the TOYOTA GAZOO Racing World Rally Team is preparing for a very different challenge on Rally Mexico: the first true gravel event of the season. Ott Tanak heads to Mexico on top of the drivers' standings for the first time after his Swedish success, while his team-mates Jari-Matti Latvala and Kris Meeke are both past winners of the event. As well as usually being one of the warmest events on the WRC calendar, with ambient temperatures around 30 deg C, Rally Mexico is also the highest round of the season. The route peaks at 2,737m above sea level, where the thinner air reduces engine power by as much as 20 percent. The rally begins again this year with the spectacular Thursday evening stage through the colourful streets and tunnels of Guanajuato. Another street stage runs next to the service park in Leon on Friday and Saturday together with laps of the city's racing circuit. On Sunday the new Mesa Cueta stage features the first half of Friday's El Chocolate test, while a second visit to Las Minas runs as the rally-ending Power Stage. 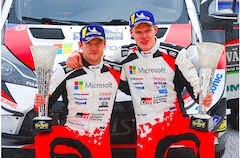 "After our brilliant win in Sweden, the team is feeling very confident that we can also have a good rally in Mexico. It is always a tough event for the teams because of the altitude and the high temperatures, but over the past year we have done a lot of work to make our car more reliable in these conditions, while also improving the performance. We have worked very hard with the cooling package in particular. Our pre-event testing in Spain last week went well and we're feeling ready." "It was a great feeling for us to win in Sweden, but we quickly changed our focus to Mexico. We flew straight to Spain for two days of gravel testing on the Monday and Tuesday after the rally. We worked on a number of different things, just trying to be as well-prepared as we can be. The whole team has been working hard and I believe we should be competitive in Mexico. As championship leaders, we will have to run first on the road on the Friday. It won't be easy but we saw in Mexico last year that it is possible to have a good result from this position, so let's see how it goes." "I am looking forward to being in Mexico: particularly the warm sun at the end of the Finnish winter! So far, it hasn't really been the start to the season for me that I would have wanted. If there is one positive from this, however, it is that I will have quite a nice starting position for the first day in Mexico, as the eighth car on the road. I had a good test in Spain last week, using pretty much the same setup that I used to win in Australia, with just a few small tweaks. Most importantly, I am confident that as a team we are totally prepared this year for the altitude and the high temperatures." "I had two days of testing in the south of Spain last week, which was my first time driving the car on gravel outside of Finland. It was really useful for me and I came away feeling comfortable. Mexico is a place I've gone well in the last few years: I won in 2017, and last year I was in the fight for the victory and finished third. Now with a different car I hope to be competing at the sharp end once again. Monte Carlo and Sweden were events with very complicated conditions where it would have been easy to make a mistake. Mexico is usually a lot more consistent, and I'm looking forward to it." In his first rally on gravel in the Toyota Yaris WRC, Ott Tanak showed good performance in Mexico, lying third overall and within reach of the lead before suffering a turbo issue on Saturday morning. He restarted on Sunday and won the Power Stage ahead of Jari-Matti Latvala, who finished eighth overall under restart rules following an alternator failure on Friday. Esapekka Lappi was also forced to restart in the third Yaris WRC after going off the road.